Utilizing freely available images from operational geostationary weather satellites, we develop a novel reliable capacity for systematic rapid first discovery and confirmation of wildfire ignitions over high fire danger regions in the continental U.S.
GOES-EFD development is an ongoing collaborative effort led by UC Davis Center for Spatial Technologies and Remote Sensing (CSTARS), US Forest Service Remote Sensing Applications Center (RSAC), and the Remote Sensing Lab of the US Forest Service Pacific Southwest Region. Every year catastrophic wildfires in the United States make news headlines by taking lives, endangering public safety and health, consuming natural resources, and incurring increasingly unsustainable societal costs, only a small fraction of which are the billions of dollars annually spent on suppression. For example, the 2013 California Rim Fire near Yosemite National Park was 3rd-largest fire in the State’s history, with ~$130 Million of suppression costs and estimated ~$1 Billion in various losses. Wildfire First Response: Every Minute Counts! 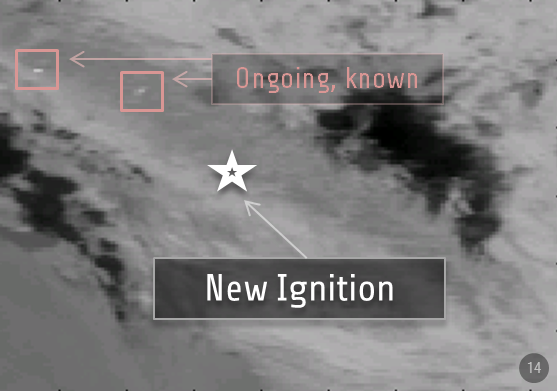 Presently, new ignitions in the United States are identified primarily by reports from the general public, commercial airline flights, fire lookout stations, and dedicated aerial reconnaissance during periods of high fire risk. Most of the wildfires are rapidly seen and reported. However, as these conventional discovery methods are non-systematic or geographically limited, there are routinely situations where fires may go undetected for hours or days, both in remote and populated areas: downed power lines in the overnight hours, smoldering ignitions after lightning events, incompletely extinguished or illegal campfires, and for other reasons. After an initial report, significant confusion and uncertainty may remain about the incident location, magnitude, or its very existence, making it difficult for first responders and managers to plan and execute appropriate actions. NOAA geostationary weather satellites called GOES routinely image Northern Hemisphere every 15-30 minutes, which is frequent enough to provide early alarms about ignitions. However, these images also have a relatively coarse spatial resolution: for example, one GOES thermal infrared pixel in California spans about 25 km2 (9.7 sq. miles). 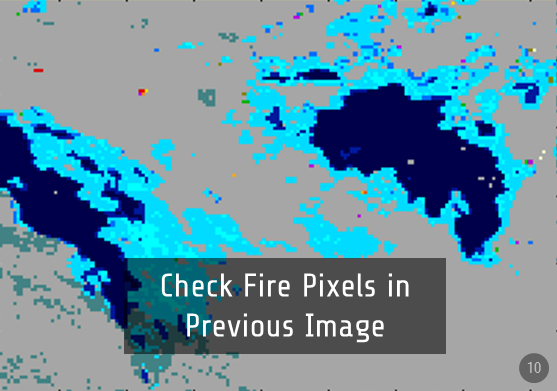 As a result, the wildfire flaming area normally occupies only a tiny fraction of a pixel, which often makes it difficult to automatically discern ignitions from natural changes in temperature. 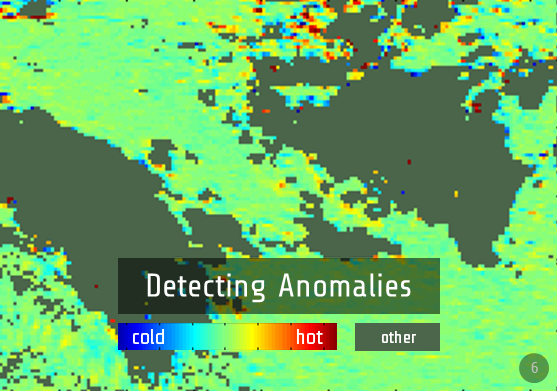 Thus, to detect fires as quickly as possible, the image processing algorithm needs to be highly sensitive to subtle heat anomalies and first signs of change from “no-burning” to “burning”. Unfortunately, there is no such algorithm in operations today. 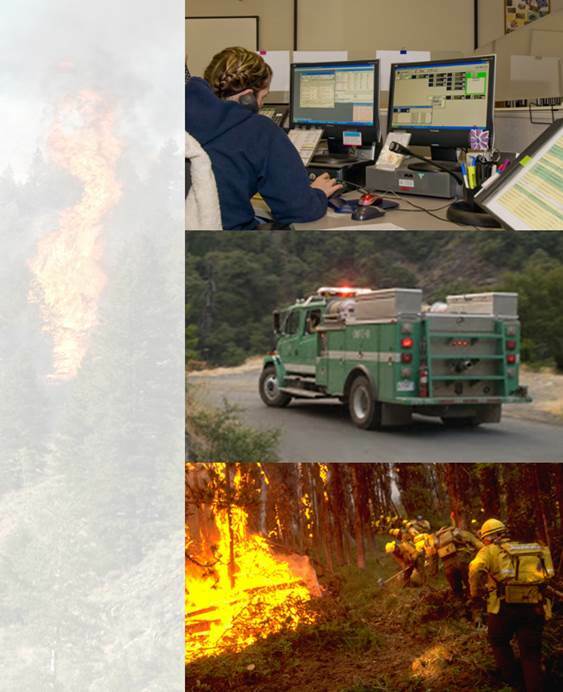 The only NOAA geostationary wildfire monitoring algorithm, the Wildfire Automated Biomass Burning Algorithm (WF-ABBA), was designed and optimized for applications where timeliness of fire discovery and its reliable confirmation are of low priority, contrasting to the needs of first responders. Faster initial response helping save lives, property, and resources. 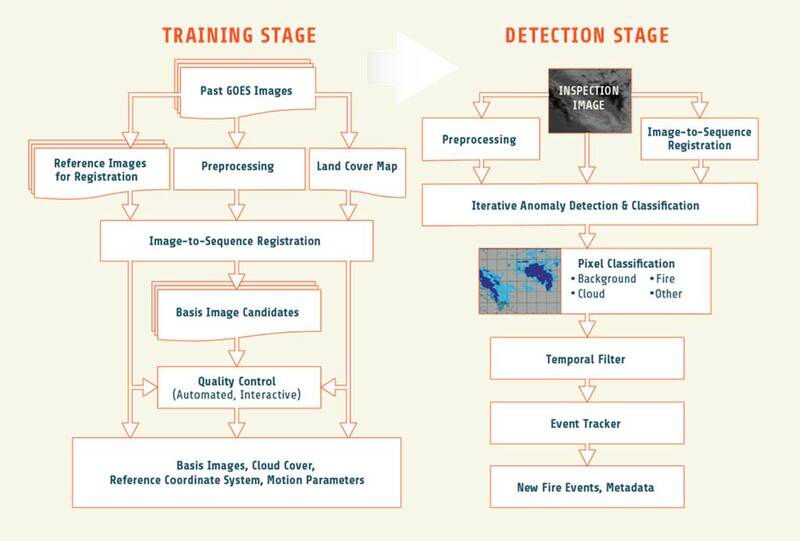 What’s special in the GOES-EFD approach to detection? The system’s core modules are based on the heritage and novel advanced anomaly detection models that work together to accurately estimate expected temperatures for non-burning landscapes and detect subtle anomalies in GOES image sequence. Will GOES-EFD be able to detect every wildfire early? No. There are many reasons why wildfires can remain undetected from space for extended periods or altogether. They can be covered by clouds and fog, occluded by steep terrain, too small or short-lived, produce a low heat output, or omitted due to trade-offs in the algorithm design and other reasons. Not every early detected incident can be quickly contained. However, every minute of lead time provided by earlier detection reduces the risks due to latent or unconfirmed ignitions and untimely or uninformed decision making by the first responders. Over time, these risks tend to translate into losses that will be prevented by GOES-EFD, a low-cost systematic fire discovery tool. 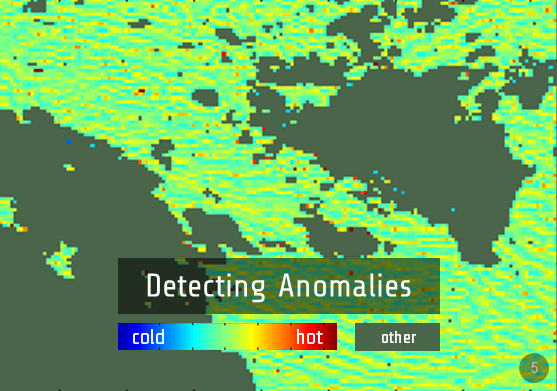 – more reliable ignition detection than using hot spots mapped by NOAA WF-ABBA system. – detect forest fires down to 1/4 acre. Preventing only a few ignitions from turning into a disastrous mega-fire would save hundreds of millions of dollars in prevented losses and potentially — human lives. The expected return on investment for GOES-EFD is much greater. Will GOES-EFD be free of false detections? No. 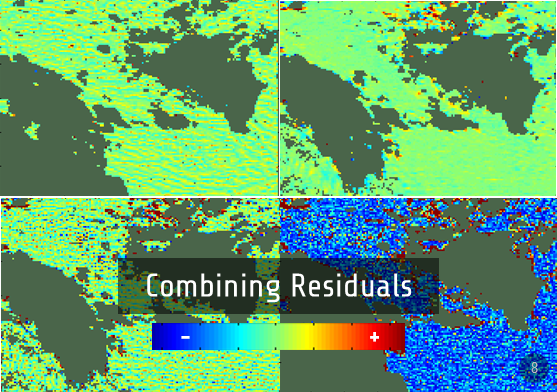 As with any other real-time satellite remote sensing product at low spatial resolution and a very low cost, omission and commission errors are likely unavoidable. 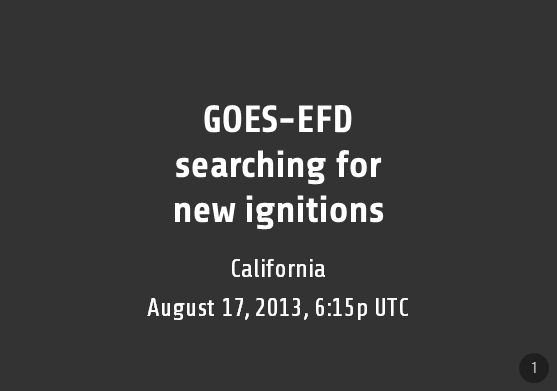 Therefore, the locations flagged by GOES-EFD as new fire incidents are considered candidates pending confirmation. Such confirmation can be obtained from the next image processed minutes later by GOES-EFD or from an independent source. In other cases, such as during periods of high fire danger, when potential for fire growth is high and so are the risks due to delayed response, the GOES-EFD detections could trigger an active response, such as airborne reconnaissance or deployment of suppression resources. 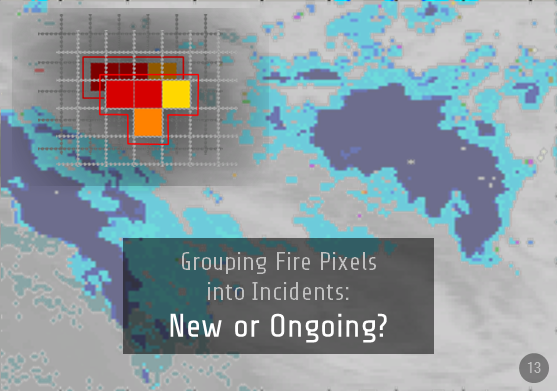 Will GOES-EFD replace other satellite fire map products, algorithms? No, not even when the development is complete and the system is fully operational and best-performing. Much like active fire monitoring algorithms are not optimal for early alarming, the GOES-EFD may not be optimal for monitoring protracted incidents or supporting environmental research. 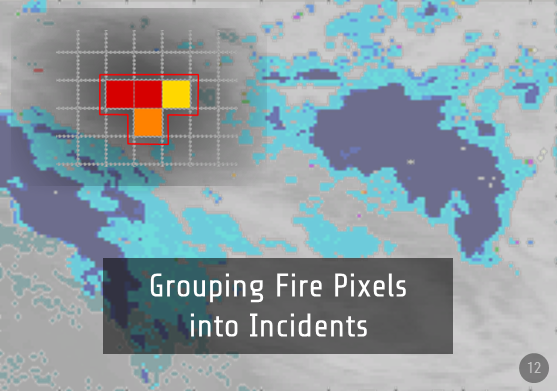 Consistent, global-scale monitoring and systematic characterization of known, on-going wildfires can be best accomplished by a specially designed fire monitoring algorithm, such as GOES WF-ABBA, or daily fire maps from polar-orbiting satellites, such as the MOderate Resolution Imaging Spectroradiometer (MODIS) and the Visible Infrared Imaging Radiometer Suite (VIIRS). 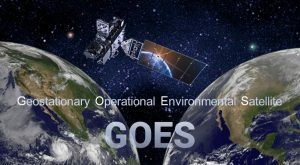 GOES-EFD will complement these products and other fire discovery and monitoring methods. 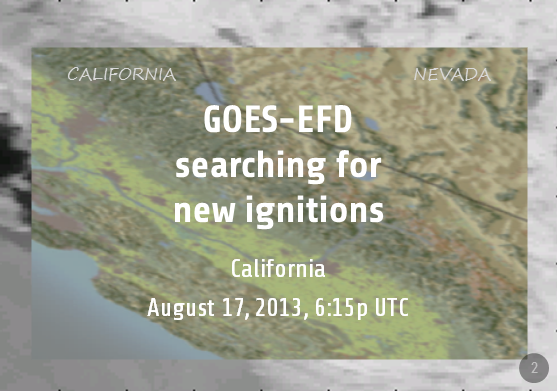 When will real-time products from GOES-EFD be available? We have completed initial integration and verification of the prototype system and are moving forward with further development, testing and validation, as available funding permits. We thank our sponsors for support.